Lightweight w/ a small footprint, this electric outboard motor for kayaks reads GPS signals to calculate remaining range in time and distance. 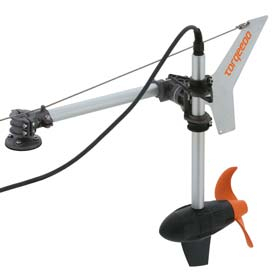 Torqeedo's Ultralight 402 weighs a mere 15-pounds including the battery. 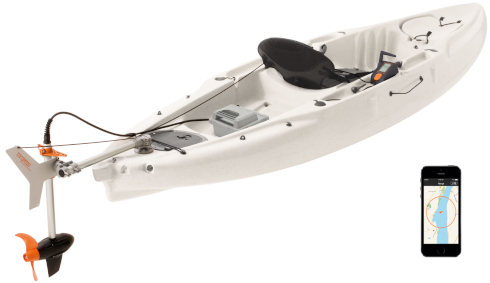 It easily mounts on most rigid kayaks and can operate when temporarily submersed. Its thrust is equivalent to a one-horsepower gas outboard, enough torque to move a kayak at a maximum speed of about six knots for about a half an hour. Range at slow speeds is from 12- to 15-miles. Heart and soul of the new machine is the synergy of cutting-edge electric motor technology, lithium batteries and advanced propeller design. An onboard computer juxtaposes information from the motor, the batteries and a built-in GPS in order to calculate remaining battery charge and range. Torqeedo's new Ultralight 402 has a suggested retail price of $1,799.